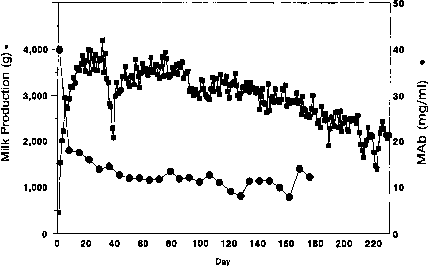 Figure 1 (a) Milk and recombinant antibody production during the first natural lactation of a transgenic goat during the 1996 season, (b) Milk and Antithrombin III production during the second natural lactation of a transgenic goat during the 1995 season. Work from Cenzyme Transgenics Corp. (1996). 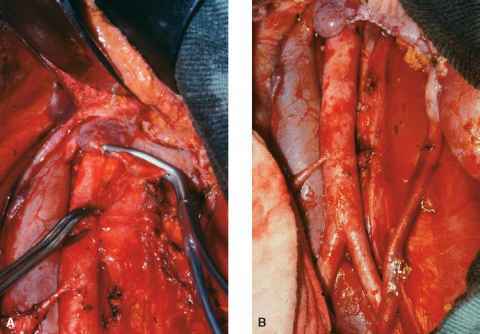 bacteria derived from the teat as well as somatic cells derived mostly from the lymphatic ducts of the udder. According to the Pasteurized Milk Ordinance (U.S. Department of Health and Human Services, 1993), the bacterial plate count should be less than 100,000 per milliliter. 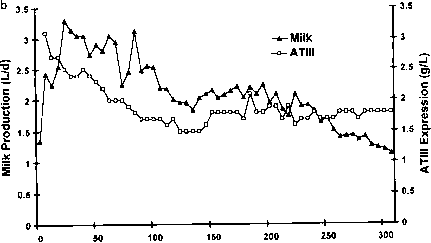 Milk composition is species specific,- major differences are seen between human and ruminant milk. Within a species, the composition varies with breed, diet, and other factors. Volume and composition also vary during lactation. Table 3 gives the average percentage compositions of livestock milk. Milk is approximately 85-90% water; the pH is 6.5-6.7 and as high as pH 6.8 in ewe's milk. It is important from a purification point of view that the fat is present in globular form in the size range of 0.1-10 (xm and with a density higher than the other constituents. The fat globule is enclosed in a membrane of polar lipids and proteins. 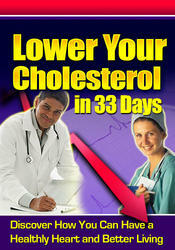 Triglycerides make up 97% of the fat.